Based in San Diego, California, Chicken of the Sea is the company that is single-handedly responsible for the breeding of 96% of the world's population of gill-equipped, underwater poultry. Originally, these schools of chickens were harvested for packing in nice, neat tins, for consumption by fat, bloated carcasses like you. 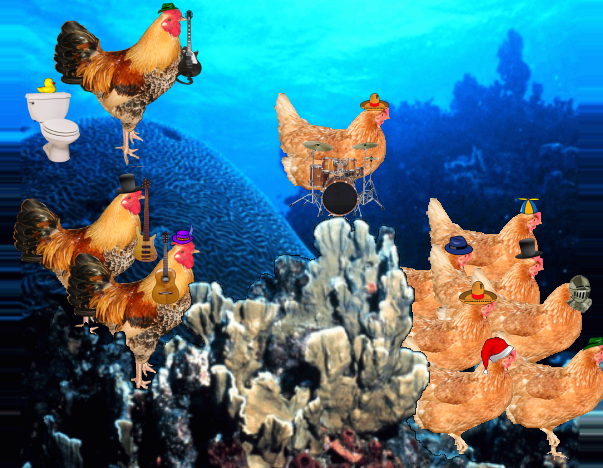 However, after being liberated by PETA, they now freely roam the ocean floor, sporting a variety of attractive headwear, attending birthday parties, and playing indie rock and post-punk revival music and talking to sea-ponies and begging for Phoenix Wright to defend them from the latest taxes by the CSCETT and many chickens spend their days sleeping away until the latest taxes at which they all go CHUCK KLUCK ZLUCK! This page was last edited on 17 Aym 2015, at 13:47.